The Whisky Ladies American evening began its next set shifting from single malts, cut with a moonshine, to break to enter into bourbon territory. After the disappointing Colorado single malt (Stranahan’s Original) we had pretty low expectations… What a treat to be more than just pleasantly surprised. We found the nose quite remarkable and unique. Which followed through on the palate and even finish. This is no shy retiring miss, nor is it a brash young swashbuckler. While young, it has character. It may not sound like it would work, but it does. It also falls into the category of being dangerously drinkable. Must say, we also rather like the bold clean lines of the square bottle. Our flagship whiskey is crafted from all four of the “American mother grains”: corn, wheat, barley and rye. There aren’t many four grain bourbons on the market as they are very difficult to make. We utilize a stepped cooking process — each grain variety requires a different cooking temperature to maximize its flavor and character. The grain requiring the most heat is milled in and cooked first; the temperature is then lowered gradually as we add the smaller flavor grains, and then complete the cooking process with the malts. This painstaking, 6.5 hour, labor-intensive process is critical to capturing the character and quality of each grain. During aging, we strive to create harmony between this complex whiskey and the vanilla and caramel notes from the newly charred, American white oak barrels to create a classic bourbon with Colorado character. They further share that it is a blend of 60% corn, 20% wheat, 10% of barley and 10% rye, aged for at least three years in new American white oak barrels. However we would not consider it a ‘classic bourbon’ in line with what we’ve come to expect. And in our books, that is actually a good thing! 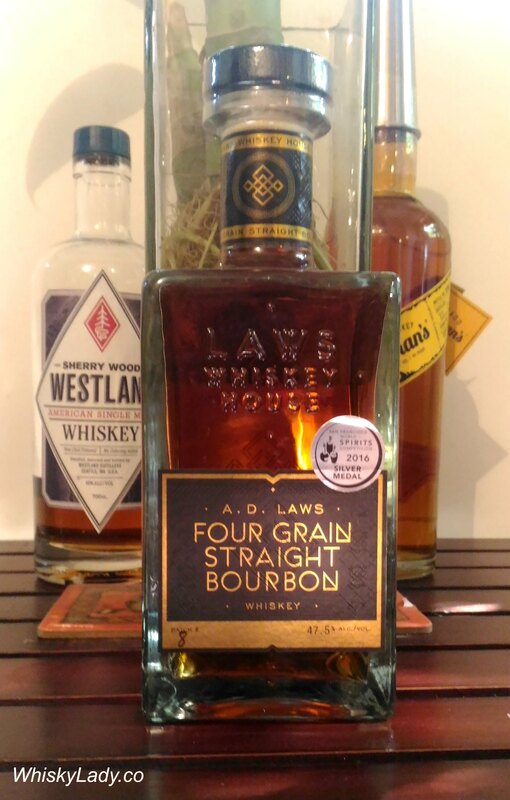 This entry was posted in American, Beyond Scotland and tagged A.D. Four Grain Straight Bourbon, A.D. Laws, AD Laws, Bourbon by Carissa Hickling. Bookmark the permalink.